It takes sunlight approximately 8.3 minutes to reach the Earth from the Sun. Accenture Consulting offers some hope to green-car advocates and clean-energy fans. Based on a survey, it suggests that more than half of Millennial consumers (born from 1982 to 2002) will sign up for solar panels within the next five years. That compares to less than one-fifth (18 percent) of Baby Boomers, defined as those born from 1946 to 1964. A global renewable energy transformation is underway. The proposed merger between Tesla and Solar City outlines the shape of things to come. The integration of solar panels with battery storage and electric vehicles is the paradigm for both ecological global economic growth. This is the model for a global renewable energy company with a comprehensive and compatible product line. Elon Musk of Tesla understands that the combination of increasingly cheaper solar panels with rapidly developing and affordable battery storage makes 100% renewable energy systems achievable globally. Mega battery and photovoltaic factories, being constructed by Tesla and others like Faraday Future in the United States, and in India, China, Ghana, mean that global industrial productive might is being rapidly deployed for a renewable energy transformation. Benchmark Mineral Intelligence estimates that at least 12 lithium ion mega-factories will come online by 2020. Seven of them in China. Sony is pushing forward with sulfur lithium battery development. China has passed the US in yearly production of electric vehicles by the start of 2016. 250,000 to 180,000 a year. China is now also global leader in lithium battery anode production. The French oil giant Total has bought the lithium battery company SAFT for $950 million as big oil is beginning to see where the sun is shining. And even the Saudis are now planning for major solar development as oil revenues collapse. Lithium batteries now expected to reach just $100/kWh by 2020, according to an Elon Musk statement in July, 2016. When the powerwall was released in May 2015, Tesla was selling the 100kWh powerpack for USD25,000, or USD250/kWh. Reaching $100/kWh by 2020, with gigafactories operational, is very tough, but possible. Bloomberg New Energy Finance recently compared the growth of lithium-ion energy storage systems to the solar photovoltaic industry; finding that some 12 years will be needed before the total ESS output can meet today’s solar output (provided of course that was the goal of today’s solar industry). The biggest ally of energy storage, giving the segment enough momentum to narrow the gap with PVs is of course, electric vehicles, which help to drive up the scale of production for lithium-ion batteries, and enables faster cost reductions. BNEF states current costs of energy storage at over 300/kWh, but expects that number to come down to $120/kWh by 2030. Some would call this too conservative a forecast, but even BNEF themselves are more optimistic than few years ago, when they estimated $150/kWh in 2030…so the numbers are trending in the right direction. home solar plus storage and electric vehicles will provide new consumer choice for how Americans power their homes and their cars. Earlier this year, home solar quietly reached a million homes, twice the number of EVs on the road. Electric vehicles are progressing toward mainstream affordability, but solar has already reached a wide spectrum of household income levels. This is because widely available financing eliminates upfront investment and provides energy bill savings from day one. Lower solar costs point towards nationwide consumer uptake. Low-cost home batteries to store solar electricity will ignite the full shift to self-powered mobility and clean electricity sooner than many think possible. Consumers are set to leave the fossil energy supply chain — including its price volatility and pollution — in the dust. Instead, their energy costs will be lower and locked in — as reliable as the sun rising each day. manufacturing giant LG will deliver batteries to GM in 2017 at prices far below what analysts have expected, and will undercut Tesla’s current pricing by 50% or more. Consumers today are accustomed to and demand choices. This is happening across hospitality and entertainment. Technology is creating new choice in the $500 billion annual market for cars and light trucks and in mobility generally — the comparably massive $400 billion annual electricity market will not be an exception. Now that rooftop solar beats retail utility electricity prices in 15 states and counting, agile home solar companies have attracted today’s consumers with superior experience plus a compelling savings proposition. This is demonstrated by their customer experience scores on par with Southwest Airlines or Zappos. Home energy management with solar, storage and EVs, plus smart in-home technology for comfort and reliability, are things that central utilities aren’t equipped to deliver and that consumers don’t trust them to reach into their homes to provide. Solar providers have already been invited in. Consumer choice empowered by the unique flexibility of modular technology to generate and store energy at any scale or location (and then fuel our cars with it) is unprecedented. There is an enormous transformation of the combined trillion-dollar transportation and energy sectors underway. Home charging stations: Once a charging station is installed in your home, charging your EV or PHEV is as simple as plugging it into an electric outlet. PHEVs have relatively small batteries, which recharge in shorter times and can use a regular 120 volt outlet. Depending on the vehicle type, Level 1 charging can take 8-12 hours, whichis perfect for overnight charging. Full battery EVs have larger batteries, so a Level 2, 240-volt circuit charging station will be more suitable. Level 2 charging takes 4-8 hours. Federal Tax credits for charging equipment: Consumers who purchase qualified residential charging equipment prior to December 31, 2016 may receive a federal tax credit of up to $1,000. Businesses and investors who purchased charging equipment may receive a federal tax credit of 30% of the equipment and installation cost, up to $30,000. Learn more about the Alternative Fuel Vehicle Refueling Property credit here. Utility incentives for residential charging equipment: If you are a NIPSCO customer and own or are considering purchasing an EV, you may be eligible to receive a credit of up to $1,650 for the installation of a residential electric vehicle Level 2 charger. Along with this charging stations, you would receive free charging between the hours of 10 p.m. and 6 a.m. daily. Learn more here. Utility incentives for businesses and organizations to install public charging equipment: NIPSCO customers can receive rebates for public charging equipment. Learn more about this opportunity here. Tax credits for new EVs and PHEVs: The Qualified Plug-In Electric Drive Motor Vehicle Tax Credit provides a $2,500 federal tax credit for vehicles with batteries of at least 4 kWh and $417 for each extra kWh. The maximum tax credit is $7,500. The Toyota Prius Plug-in Hybrid qualifies for $2,500, and the Nissan Leaf and Chevy Volt qualify for the full $7,500 tax credit. Click on the following links to see the tax credit amounts for PHEVs and EVs. This incentive applies only to the first 200,000 cars sold for any given company, and the credit will be slowly phased out after that. This credit also applies only to new cars, so make sure the car dealership has not already registered the car in its own name. To claim your federal tax credit, complete the 8834 tax form titled “Qualified Plug-in Electric and Electric Vehicle Credit. Then report that you have claimed a credit on your “U.S. Individual Income Tax Return” 1040 tax form. Businesses should fill out the 3800 form titled “General Business Credit” and fill out Section B of the 8834 form. Finally, the tax credit only applies to your tax liability – if you have a tax liability of less than $2,500, then you will not receive the full credit. With up to 200 stations planned in Indy, you can find an electric car wherever you need one. From downtown to the city limits, north to south and east to west, BlueIndy lets you follow your whims, whatever road they may take. EnerDel designs, builds and manufactures lithium-ion energy storage solutions and battery systems with a focus on heavy duty transportation, on- and off-grid electrical, mass transit and task-oriented applications. EnerDel was the first in the U.S. to mount commercial-scale production of large-format, prismatic, lithium-ion battery packs. EnerDel currently has two facilities in the Indianapolis area, as well as a manufacturing facility in Korea. EnerDel’s product suite delivers energy-dense solutions for both high-power and high-energy applications, including one of the highest energy-dense cells in the industry. The company uses superior materials for added safety and better performance. On November 24, 2010, Think North America began manufacturing in the Magnum Drive plant located in Elkhart, Indiana. Initially the Finland plant manufactures the body and wheels on the chassis, then ships them to the United States. The lithium-ion battery, made by EnerDel in Indianapolis, the motor and gearbox, seats, headlights and other components are assembled in the Elkhart plant. Each car takes about a week to complete. General Motors is #1 in plug-in hybrid (PHEV) sales with the Chevrolet Volt, a four-passenger compact hatchback that has 50+ miles of electric range and more than 400 miles per gasoline fill-up range in its second generation. The Volt has a starting price of about $34,490, but is eligible for federal and state incentives. Its sales have bumped up with the updated version that hit in late 2015 as a 2016 model. We’ve spent quite a bit of time in this car and think it’s a keeper. It’s won more than a few accolades. The versatility to drive around town and potentially commute as an electric car (Chevy estimates most drivers will go more than 1,000 miles between fill-ups), coupled with the ability to take longer trips relying on the gasoline “range extender” makes it a great choice for a one-car household. Also at GM is the all-electric Chevrolet Spark EV (on sale in California and Oregon) for about $26,685; it’s a fun city car with 80-mile range between charges. Sales are slow for the Cadillac ELR, which uses a plug-in hybrid drive system similar to the Volt, and it will be going out of production. It retails for $75,000, but many discounts are available. It also may get a facelift and the new Volt system when it becomes available. And promised to be right around the corner is the Chevy Bolt—an all-electric designed to beat Tesla’s “affordable” electric to the market with 200+ mile range and a $35,000 price tag. Ford has made a commitment to fuel efficiency that starts with their widely used EcoBoost engines (basically smaller turbocharged direct-injection engines that can replace larger non-turbo port-injection powerplants). They have a trio of plug-in vehicles that are the tip of the spear for their environmental efforts. They start with a full-electric Ford Focus and two plug-in hybrids, the Fusion Energi and C-Max Energi (both of which also come in a plain-Jane hybrid version). Sales have been steady, but slow as they are the second and third best-selling models in the PHEV sales behind the Volt. They sacrifice some trunk space for the added batteries (compared to the hybrid models), but deliver solid performance and enough for 21 miles of electric-only driving. The total gross state product in 2005 was US$214 billion in 2000 chained dollars. Indiana’s per capita income, as of 2005, was US$31,150. A high percentage of Indiana’s income is from manufacturing. The Calumet region of northwest Indiana is the largest steel producing area in the U.S. Steelmaking itself requires generating very large amounts of electric power. Indiana’s other manufactures include pharmaceuticals and medical devices, automobiles, electrical equipment, transportation equipment, chemical products, rubber, petroleum and coal products, and factory machinery. 2/5/2015 FORT WAYNE, Ind. – Indiana Michigan Power (I&M), an operating unit of American Electric Power (NYSE: AEP), will add solar energy to its generation fleet following the Indiana Utility Regulatory Commission’s approval of I&M’s plans for five solar facilities with a combined capacity of nearly 16 megawatts. Indiana Michigan Power has started up its first solar power plant and now is planning three more, the utility reported Tuesday. The Deer Creek Solar Facility south of Marion, Ind., went online New Year’s Eve. Deer Creek’s capacity is 2.5 MW and is expected to power the equivalent about 350 homes. The solar power project is the first company-owned and operated solar plant for Indiana Michigan Power and AEP. Two more facilities — near Watervliet, Mich., and New Carlisle, Ind. — will also begin generating solar energy in 2016. Combined, the four facilities will have a capacity of nearly 15 MW and produce enough energy to power 2,000 homes annually. The project will consist of 9,972, 310-watt solar panels and 11 Nextronex 250 inverters. “The environmental offsets of the Deer Creek array are significant,” said Nathan Vogel, senior account executive and project manager for Inovateus Solar. “It’s equivalent to the energy of over 7,600 barrels of oil per year, 43 tankers of gasoline per year, or burning almost 18 rail cars of coal per year. We are so pleased to be working with our own Northern Indiana utility, Indiana Michigan Power, on this project.” Indiana Michigan Power has its headquarters in Fort Wayne. It employs 2,450 people and serves more than 589,000 customers. Indiana customers can participate in IM Solar, a program that allows them to attribute part or all of their electricity consumption to solar. Customers can subscribe to retire Renewable Energy Certificate blocks at $2.21 per month. One 50 kW block is equivalent to about 5 percent of a typical home’s electric use. Inovateus Solar LLC distributes solar energy products. It offers panels, inverters, and miscellaneous components. The company also offers installation services. It serves commercial, residential, and utility customers; and municipalities, warehouses and distribution centers, green building projects, universities, businesses, schools, and hospitals in the United States. The company offers its products through dealers in the United States. The company was founded in 2004 and is based in South Bend, Indiana. As a solar developer, EPC and product supplier, Inovateus Solar has partnered with some of the top module, inverter and balance of system manufacturers for the highest quality, most reliable solar parts on the market. We procure the best solar components and systems for our own utility, commercial, industrial and other large-scale projects as well as the residential installers that we support through our supply business. But the primary driver is the residential storage market, for which Sonnen offers Sony-built batteries with storage capacity of 4 kilowatt hours up to 16 kilowatt hours. Prices range from just under $6,000 to $24,000. Sonnen does not offer direct sales but rather operates through installers. Sonnen Inc., which emerged on the world stage half a dozen years ago in Bavaria, Germany, has sold 13,000 residential storage batteries worldwide at a current pace of about 900 a month. U.S. sales, managed out of the Sonnen’s American headquarters in North Hollywood, account for about a quarter of the monthly tally. In January, Sonnen announced partnerships with top U.S. manufacturers and developers, including SolarWorld, the largest crystalline-silicon solar manufacturer in the country; PetersenDean, the nation’s largest residential roofing company; and Spruce, a leader in solar and efficiency financing. Just as is the case all across the US, a federal tax credit for solar power is available in Indiana, which can cover up to 30% of the installed cost of a solar energy system. On the state level, there are also a number of state-specific incentives. Indiana Net Metering: Net metering allows utility customers to receive credit on their bills for the energy that their solar electricity system produces. 40% of a utility’s net metering capacity must be residential solar installations in Indiana, and projects up to 1 MW in size qualify for the program. In effect, this program can offset the electricity demand at your home or business with the energy generated by your home solar system. Indianapolis Power & Light Net Metering: All IPL customers who install, own and operate their own small-scale solar energy system, up to 50kW, may qualify for IPL’s Net Metering rate. Northern Indiana Public Service Company (NIPSCO): Net Metering or Feed-in Tariff programs for Indiana solar power allow owners of solar systems (or those planning to install one) to sell the power generated back to NIPSCO. Indianapolis Power & Light Company: Small-Scale Renewable Energy Incentive Program: Available to both residential and small- to medium-sized commercial and industrial customers for projects over 2kW, providing incentive payments of $1 per watt, up to $4,000 per system. Feed In Tariff (FIT): NIPSCO offers a feed-in tariff program up to $0.30/kWh for customers who generate electricity from solar panels, and all NIPSCO electric customers in good standing, with systems sized between 5kW and 5MW, are eligible for the program. Indiana Renewable Energy Property Tax Exemption: Systems that generate energy using solar power are exempt from property tax, with “the entire renewable energy system and affiliated equipment that is unique to the system, including equipment for storage and distribution” qualifying for this incentive. Indiana Income Tax Deduction for Solar-Powered Roof Vents or Fans: While not directly considered a home solar power system, Indiana allows residents to take a deduction on solar-powered roof fans or attic fans installed in a home that they own or leases, up to 50% of the cost of the materials and installation labor (up to $1,000). Rural Indiana Solar Incentive: Rural Energy for America Program (REAP) provides financial assistance (loans and grants) to agricultural producers and rural small businesses in rural America to purchase, install, and construct renewable energy systems. There are also a number of utility rebate programs for energy efficiency in Indiana, which can help make a solar PV array more effective by reducing the energy use in both residential and commercial buildings. The City of Indianapolis has the EcoHouse Project, an energy-efficiency loan program for medium- and low-income homeowners in Indianapolis, which are available for a variety of energy-efficiency upgrades, with a cap of $15,000. The Indianapolis Office of Sustainability, and the Department of Code Enforcement, offers reduced permit fees for projects in Indianapolis or Marion County meeting certain green building criteria, including the installation of solar photovoltaic systems. This green building incentive can cover up to 50% of the permit costs, and property owners or developers that are constructing new buildings (or completing major renovations) are eligible. The City of Bloomington Indiana offers waivers for filing and permit fees, and other incentives for developers, for incorporating the city’s sustainability goals, one of which is renewable on-site energy sources, into their designs. More than 52 solar companies are at work in Indiana, employing 1,500 people. In 2013, Indiana installed 54 MW of solar electric capacity, which ranks it 11th nationally. 58 MW of solar energy is currently installed in Indiana, which ranks it 20th in the country in installed solar capacity. This is enough solar energy to power 5,600 homes. In 2013, $112 million was invested to install solar for home, business and utility use in Indiana. Coal-fired electric power plants provided about 84% of Indiana’s net electricity generation in 2013, so installing a home solar system can help move the clean energy needle in the state’s energy portfolio. Indiana ranks 9th in the nation in total energy consumed per capita, so energy efficiency and clean energy generation together could go a long way to reducing that ranking. A home that offset’s 100% of its energy from a grid-tied solar system is called a ‘net-zero’ energy home, or a home that generates 100% of the energy it uses. Morton Solar is an expert in design & build of net-zero energy homes and buildings. We designed and installed the solar energy systems for the first net-zero school in the U.S. and the first net-zero library in the U.S. We also have numerous net-zero homes in our portfolio, which are located right here in Indiana, Illinois, and Kentucky. PLAINFIELD, Ind., July 7, 2016 /PRNewswire/ — More clean, renewable solar energy will soon flow to Duke Energy Indiana customers with the construction of a new 17-megawatt solar power plant at Naval Support Activity Crane, also known as the Crane naval station, located about 40 miles southwest of Bloomington, Ind. The Indiana Utility Regulatory Commission has approved a settlement agreement between the company and the Indiana Office of Utility Consumer Counselor to build the solar plant, which will sit on roughly 145 acres in the southeast portion of the naval base. It will be the second-largest solar power plant in the state, and the largest on the Duke Energy Indiana system. Construction activity will begin this month, with installation of approximately 76,000 solar panels. The power plant is expected to start sending solar energy to the grid by early 2017. Duke Energy Indiana’s operations provide about 7,100 megawatts of owned electric capacity to approximately 810,000 customers in a 23,000-square-mile service area, making it the state’s largest electric supplier. Alterra Power Corp. (Vancouver, Canada) on July 20th, 2016 announced that it has reached an agreement with Inovateus Solar LLC (South Bend, Indiana, U.S.) to acquire an 80% ownership interest in a two-project 20 MW portfolio of solar photovoltaic (PV) farms in the Midwestern United States. Both PV projects are contracted under long-term, investment-grade power purchase agreements. Alterra is actively developing and arranging financing for the first PV project, a 7 MW site located in Indiana that is expected to finish construction by the end of 2016. The second project, a 13 MW site located in Michigan, is expected to be developed during 2017. For this report, we analyze and highlight 10 states that are blocking distributed solar potential through overtly lacking and destructive distributed solar policy. These 10 states — Alabama, Florida, Georgia, Indiana, Michigan, Oklahoma, Tennessee, Texas and Virginia — account for more than 35 percent of the total rooftop solar photovoltaic technical potential in the contiguous United States, but only 6 percent of total installed distributed solar capacity, according to a March 2016 report released by National Renewable Energy Laboratory (NREL) and data provided by the U.S. Energy Information Agency. 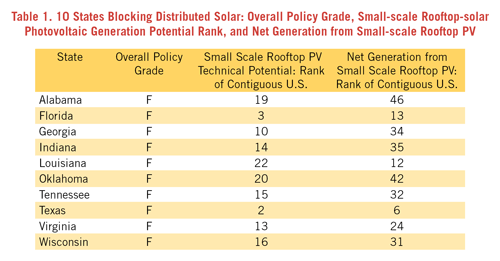 All of these states have significant barriers in place to distributed solar development and have earned an overall policy grade of “F” in our analysis. We based these grades on a thorough review of the presence, or absence, and strength of key distributed solar policies, and, combined with the overall rooftop solar photovoltaic technical potential rankings by National Renewable Energy Laboratory (NREL), identified the states that would benefit most from improvements to their distributed solar policy landscapes. Seven are lacking mandatory renewable portfolio standards (RPS), policies that are key to creating a safe market for investing in rooftop solar. The three states with mandatory RPSs in place — Michigan, Texas, and Wisconsin — have already met their low targets and have not taken steps to update their policies, so these RPSs are doing nothing to bolster the solar industry at this point. In fact Texas met its incredibly unambitious goal of 10,000 MW 15 years ahead of schedule and is unlikely to update this goal anytime soon. Three lack mandatory statewide net-metering policies, possibly the most important policy model in place in the United States that allows for solar customers to connect with the grid. Only three other states in the country can say the same. Only three allow for third-party ownership of solar panels — a financing model that has fostered a distributed solar boom across the United States by allowing for those who wouldn’t otherwise be able to afford solar panels outright to be able to install them on their property. None have community solar programs in place, which are a key policy to encourage access to distributed solar resources and ensure community resiliency. Nine lack strong interconnection laws, making the process of installing solar panels harder for homeowners, business owners and third-party companies alike. Five don’t have any solar-access laws that protect home and business owners from local restrictions on solar panel installations due to issues such as neighborhood aesthetics. All 10 of these states are bad actors in the distributed solar policy game, but two in particular stand out as the worst: Florida and Texas. 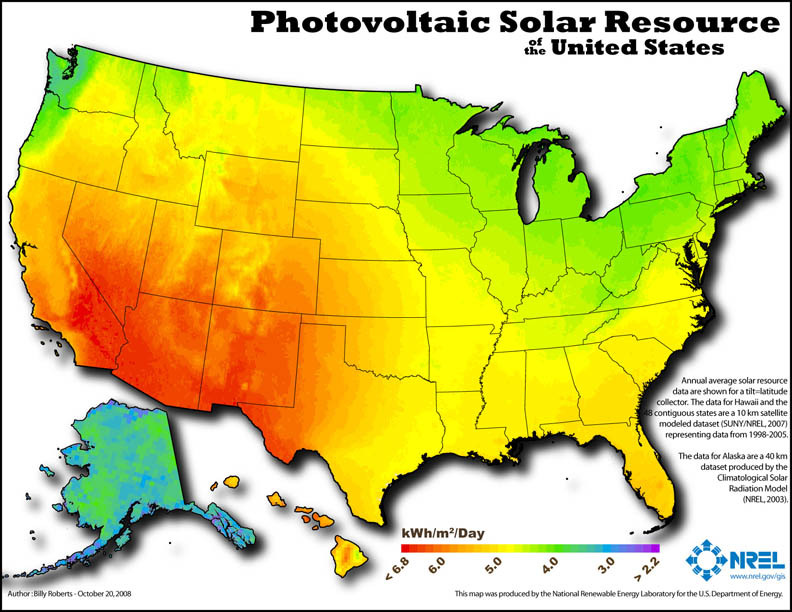 These two states fall in the top 3 for rooftop solar photovoltaic technical potential, just after California. Both Florida and Texas could feasibly have some of the best markets in the country for distributed solar growth; they make up more than 16 percent of the total technical potential for the contiguous United States. Because of bad policy landscapes, however, these states currently only account for 2.7 percent of the total installed distributed PV capacity in the United States. INDIANAPOLIS — A new report by a conservation group says Indiana has one of the nation’s worst regulatory atmospheres for fostering the development of the rooftop solar power industry. Tuesday’s report from the Center for Biological Diversity ranks Indiana among 10 states, including Michigan and Wisconsin, which essentially discourage solar-rooftop development. Indiana and the nine other states received an “F” in the nonprofit group’s assessment of policies and regulations that could help boost their solar-rooftop industries. The Center for Biological Diversity says Indiana needs to make several changes, including strengthening its billing mechanism for crediting solar power system owners for electricity they add to the grid. SOUTH MILFORD, Indiana (21Alive)-SOUTH MILFORD, Indiana (21Alive)–It’s not the sort of place you’d expect to find 21st century hi-tek science. Wible Lumber Company just outside South Milford has been manufacturing custom wood products since the 1940’s…but never like this. Wible Lumber is making a huge leap in technology, installing an immense, two million dollar solar electrical generating grid right on their property. “It’s gonna be a way for us to be environmentally friendly,” says Wible owner Dennis Nowels, “and also to control our energy costs in the future.” That’s important. Wible uses a lot of juice to run its saws and towering electric powered wood kilns, half a million dollars worth of electricity every year. This solar project will produce one megawatt of power annually and pay for itself in 6 or 7 years. After that, the company’s electricity will be essentially free thanks to new solar panel technology. As Brian Steele, chief financial officer of SafetyWear put it, “It’s hard to know when you’re a rookie” how well the system will work. All in all, though, the company’s foray into solar power is turning out well. The goal in December, when the company had the solar panels installed, was to generate 106 percent to 107 percent of its power needs. In months when the company generated more electricity than it used, it would be able to put extra kilowatt hours in a bank of sorts. In months when it needed to rely on the electric utility to meet its power needs, it could draw on those electric credits to pay its bill. The company, based on usage going back one year, consumes about 65 megawatt hours of electricity, but its solar-power system has show the capacity to generate 70 to 72 megawatt hours, meaning the company would be able to bank perhaps 7 megawatts hours per year. A glance at SafetyWear’s electric bill tells a surprising story, though. It shows that from June to December 2015, the company paid for between 4.7 and 5.9 megawatt hours of electricity every month. After the solar-powered system was installed, the company bought 2.7 megawatt hours in January and 1.4 megawatt hours in February. Since March, the business has officially bought zero kilowatt hours of electricity from Indiana Michigan Power. At an annual rate, Steele said, the system is generating about $8,000 worth of electricity per year, before tax credits, which means it will pay for itself in about half its projected life span. Indiana ranks 20th in the country in solar power per-capita, with 21 watts per person. Indiana Michigan Power is planning a solar power facility for the Watervliet area. Spokesperson Tracy Warner says ground will be broken on the facility in the spring. It’s one of four solar generation facilities I&M has planned for the greater Michiana area. I&M’s first solar facility, located in Marion, Indiana, went online December 31st, and is smaller than the one planned for Watervliet. Warner says building the facilities is all part of increasing the utility’s energy portfolio, and pleasing customers who want more renewable sources. The facility in Watervliet will be located south of Red Arrow Highway. SAN FRANCISCO, July 13, 2016 (GLOBE NEWSWIRE) — Today JLM Energy Founder and CEO Farid Dibachi, debuted exclusive features of the Energizr 200 grid synergistic renewable energy PLUS storage ecosystem for the home. Dibachi was joined by strategic partner, Fronius Director of Solar Energy Tristan Kreager. Patent-pending Symmetric DC Regulation (SDCR) technology reduces installation and operation cost by up to 50%. A Fronius Primo inverter that connects directly to Wi-Fi, providing customers with immediate data on how much power they are consuming and how much power the solar system is producing. Integration with the Honeywell Lyric smart thermostat so customers can remotely pre-cool their home during less expensive hours and avoid peak rates during the dinner hour. JLM’s intuitive Measurz software platform maintains wireless communication with both the inverter and thermostat. Whether you aim to own and operate centralized utility-scale solar power plants, procure solar energy contracts, or craft programs to offer solar directly to your customers, SunPower delivers the diversified experience required to customize an energy solution that meets your goals. We own every step of the process, from cell manufacturing to plant construction and operation. This vertical integration gives SunPower the ability to drive closed loop feedback into every step of the process. Through continuous learning and improvement we consistently deliver high-quality, energy solutions. Our dynamic Maxeon technology and industry-leading solar panels form the foundation for even deeper innovation with the SunPower® Oasis® power plant—cost-optimized 1.5 MW power blocks seamlessly integrated into a turnkey energy solution designed to maximize energy output. The SunPower Oasis power plant is a fully-integrated solution built with cost-optimized power blocks seamlessly integrated into a turnkey energy solution. High-density, SunPower power blocks are designed to maximize energy output and follow the contours of your land for optimal energy production. Oasis 1.5-MW Power Blocks come in a variety of configurations yet maintain standardization in engineering, procurement and installation. SunPower has designed and installed solar power plants all around the world. In data collected between June 2009 and June 2012, SunPower utility scale power plants delivered more than 99% availability,* ensuring that our utility power plant customers get the energy delivery they expect from their solar power plant. NextEra Energy Resources, LLC, which together with its affiliated entities is the largest generator in North America of renewable energy from the wind and sun. Through its subsidiaries, NextEra Energy generates clean, emissions-free electricity from eight commercial nuclear power units in Florida, New Hampshire, Iowa and Wisconsin. The process raised some questions, but the decision by the Wood County commissioners to grant a tax abatement for a plan to build Ohio’s largest solar farm just north of Bowling Green was the right one for the city and county. DG AMP Solar, a subsidiary of NextEra Energy Resources, will be building a 20-megawatt solar field and power station on city-owned land. Even though the deal will save the company $8.28 million in taxes over the 30-year-deal, it will make $5.4 million in payments, with about $2.8 million going to Bowling Green schools. How much does a 5kW solar system cost in my state? According to the GTM, the U.S industry is believed to install approximately 14.5 gigawatts of solar power in 2016, a rise of 94% as compared to over the record 7.5 gigawatts installed in 2015. Due to this increasing installation of solar power, the revenues from solar installation increased over 21% to $22 billion in 2015 as compared to 2014. The momentum in solar installation is clearly seen this year, as GTM reported approximately 1,665 GW of solar PV in the first quarter of 2016. Thus, the increase installation this year should allow the solar companies to improve their top line performance this year. SunPower, the second largest U.S. solar equipment manufacturer, is expected to publish its Q2 earnings in the coming weeks. We expect the firm’s revenues to trend lower on a year-over-year basis, amid weaker revenue recognition in its power plant business as it builds out assets for sale during the second half of this year under its Holdco strategy. On a Non-GAAP basis, the company has guided for revenue of $310 million to $360 million for the quarter with a gross margin of 12% to 14% and EBITDA of zero to $25 million. As of April, SunPower had a total of seven power plant projects due for completion during 2016 with a total capacity of about 575 MW. These projects will be sold to 8Point3 Energy partners – SunPower’s JV yieldco with First Solar – or to third party buyers. However, most of these projects have commercial operation dates of between Q3 2016 or Q4 2016. This could potentially result in weaker revenue recognition for the second quarter, although this should be offset by significantly stronger Q3/Q4 results. Separately, we will also be watching the company’s progress in improving its project visibility for 2017 and beyond, which remains somewhat weak. SunPower’s residential business could also face some headwinds in the U.S. amid policy changes relating to net metering in states such as Nevada and Arizona. Near-term residential sales could also be impacted by the extension of the U.S. solar ITC, which reduced the urgency for homeowners to install solar systems before December 2016 to avail tax credits. However, this could be partially offset by the introduction of SunPower’s Equinox integrated solution – which combines panels, mounts and micro inverters into a single package The company indicated that Equinox accounted for over 40% of the new bookings for its residential unit, as of May. SunPower’s factories ran at full capacity over Q1, as the firm built up inventory for its second half project completions, and it is likely that the trend will continue into Q2 as well. The company intends to boost production capacity to about 1,850 MW by the end of this year, up from 1,400 MW at the end of last year by ramping up capacity of its Fab 4 plant (from 30 MW to 350 MW) and also by expanding the production of its just launched P-Series modules (60 to 80 MW of capacity by year-end). P-series modules offer higher conversion efficiencies compared to multi-crystalline panels, at prices which are lower than SunPower’s monocrystalline offering. These panels could be increasingly important to SunPower, as panel prices decline, amid strong manufacturing capacity expansion and weaker demand from China. 2007 – A second manufacturing facility (Fab 2) with 330 MW capacity rating on 10 lines, comes online in the Philippines. 2011 -Total SA and SunPower partner to create a new global leader in the solar industry. SunPower launches the C7 Tracker which concentrates the sun’s power seven times to achieve the lowest levelized cost of electricity (LCOE) for utility-scale solar power plants. 2013 – SunPower and U.S. Bancorp team up to offer “Zero-Down” financing and direct-from-manufacturer performance guarantee. 2014 – SunPower achieves production milestone, manufacturing its one-billionth solar cell. SunPower acquires SolarBridge Technologies, Inc., for high performance microinverter technology that offers system design flexibility and lower cost of installation. SunPower invests in integrated technology solutions to help customers manage their cost of energy, reinforcing the company’s evolution to offering Smart Energy solutions for its residential, commercial and utility customers. 8point3 Energy Partners is a growth-oriented limited partnership formed by First Solar and SunPower to own, operate and acquire solar energy generation projects. Our primary objective is to generate predictable cash distributions that grow at a sustainable rate. We intend to achieve this objective by acquiring high-quality solar assets primarily developed by our Sponsors that generate long-term contracted cash flows and serve utility, C&I and residential customers in the United States and other select markets, primarily within countries that comprise the Organization for Economic Co-operation and Development (OECD). Our initial portfolio includes interests in 432 MW of solar energy projects. When First Solar (NASDAQ:FSLR) and SunPower (NASDAQ:SPWR) launched yieldco 8point3 Energy Partners (NASDAQ:CAFD) last year, their goal was to create a big buyer for the solar projects they planned to build. To fund such acquisitions, yieldcos ideally like to sell a combination of new equity and debt, if those assets can be sold at a price that would add to the dividend over the long term. The problem most yieldcos have faced in the past year is that their stock prices dropped and their dividend yields rose to a level that made it impossible for them to buy projects that would be accretive to the dividend. So, they couldn’t raise new funds and bought fewer projects as a result. No one knew who would buy projects in the future, adding to uncertainty for developers. But that might be changing. Over the past few months, though, 8point3 Energy Partners shares rose to the point that its dividend yield is at a reasonable 5.9%. That’s low enough that the company can offer new shares and debt to buy projects, and have them be accretive to the business and the dividend. SunPower Corporation is an American energy company that designs and manufactures crystalline silicon photovoltaic cells, roof tiles and solar panels based on an all-back-contact solar cell invented at Stanford University. The company is owned 66% by Total, Europe’s third largest oil company, and is publicly traded on the NASDAQ as SPWR (formerly SPWRA and SPWRB); it is a component of the Dow Jones Oil and Gas Index DJUSEN. Since 1985 SunPower has been leading global solar innovation. SunPower solar panels consistently deliver more energy and long-term peace of mind with the highest performing solar power systems available. SunPower is the solar energy choice of more homeowners and businesses around the world. SunPower Corporation (NASDAQ: SPWR) designs, manufactures and delivers the highest efficiency, highest reliability solar panels and systems available today. Residential, business, government and utility customers rely on the company’s quarter century of experience and guaranteed performance to provide maximum value throughout the life of the solar system. Headquartered in San Jose, Calif., SunPower has offices in North America, Europe, Australia, Africa and Asia. In 1997, The company solar cells were used in NASA Pathfinder high altitude aircraft. In January 2007, SunPower corporation acquired PowerLight Corporation, a leading global provider of large-scale solar power systems. In February 2010, it acquired Europe’s SunRay Renewable Energy for $277 million. On 29 April 2011, Total S.A. agreed to buy 60% of SunPower for US$1.38 billion. On 23 December 2011, the company announced an agreement to acquire Tenesol SA. In October 2014, the company was described as “Silicon Valley’s dominant solar panel manufacturer.” On February 23, 2015, SunPower (SPWR) and First Solar (FSLR) announced plans to set up a joint yieldco. SunPower has recently announced a number of projects around the world that utilize its patented solar tracker technology. The company maintains a market-leading position in Spain with more than 61 megawatts installed or under construction; recently completed a 2.2-megawatt solar power plant in Mungyeong, Korea, the 15-megawatt Nellis Solar Power Plant in Nevada, and the 579-megawatt Solar Star PV power plant – the largest solar PV power plant in the US. On October 6, 2008, Agilent Technologies and SunPower Corporation announced that a 1-megawatt solar tracking system at Agilent’s campus will start producing electricity in mid-October. The system features a 3-acre (1.2 ha) parking lot canopy structure with nearly 3,500 SunPower solar panels that track the sun throughout the day. The design of the company’s tracking solar system will generate up to 25 percent more energy for Agilent than a similarly sized flat, rooftop system, the company said. As a result, Agilent’s solar parking canopy is the largest solar energy generator in Sonoma County, California. SunPower donated the solar cells for the NASA/AeroVironment Pathfinder-Plus high-altitude UAV, which then set an altitude record of 80,201 feet (24,445 m) for solar-powered and propeller-driven aircraft. On August 4, 2010, the company announced it has completed a 505-kilowatt solar power installation for Horizon Power, a government-owned utility providing power to remote and regional communities and resource operations in the Marble Bar and Nullagine areas of the east Pilbara region of Western Australia. The ground-mounted SunPower T20 Tracker installation is the largest solar tracking system in Australia, and powers the world’s first high penetration, hybrid solar-diesel power stations. The power stations will generate approximately 1,048 megawatt hours of solar energy per year and will produce 60 percent to 90 percent of daily electricity needs for the remote communities. This project was supported by the Australian Government through the Renewable Remote Power Generation Program and implemented by the Office of Energy in Western Australia. In 2011, SunPower and Ford announced they would give Ford electric car buyers an option to install a residential solar panel placed as part of the rooftop that will charge the electric car. In December 2011, the company announced the collaboration with the Solar Impulse project for the building of HB-SIA their first solar airplane, and later HB-SIB the second airplane attempting a round-the world in 2015. In June 2012, the company announced the completion of solar panel installation on the second ZeroHouse 2.0, a “net-zero” home, on the East Coast. The home, built by KB Homes and located in Waldorf, Maryland, uses solar power and energy efficiency to produce as much energy as it uses. The company’s shares have been listed on the Photovoltaik Global 30 Index since the beginning of this stock index in 2009. First Solar (FSLR) is aggressively reducing its operating expenses. For instance, its operating expenses in the previous quarter came in at $97.69 million, a decrease of 10% as compared to operating expenses of $109.09 million in the same quarter last year. The good part is that this improved operating costs structure is driving its margins. As such, its operating profit for the quarter increased 25% to $165 million as compared to operating profit of $132 million in the first quarter of 2015. Looking ahead, First Solar expects its cost per watt to decrease significantly due to rise in the capacity and increased installation, driving efficiencies and margins. At this point, the investors should not forget that First Solar is expected to install approximately 3.1 gigawatts of solar, representing approximately 21.5% of the total installed solar power in the United States. Thus, First Solar remains a solid bet with the improvement in the technology. These advancements in the technology will enable the company to reduce its production costs significantly in the future, as stated above. Moreover, the market for solar remains bullish going forward which should keep its top line performance intact ahead. So all-in-all, First Solar is a safe investment in the long-run. With more than 10 gigawatts (GW) installed worldwide, we believe that clean affordable solar electricity is an essential part of the worldwide energy mix. Our proven energy solutions have diversified the energy portfolio and reduced the risk of fuel-price volatility, while delivering an LCOE that is cost competitive with fossil fuels. First Solar has developed, financed, engineered, constructed and currently operates many of the world’s largest grid-connected PV power plants in existence. By integrating technologies, services and expertise across the entire solar value chain, First Solar delivers bankable PV energy solutions that enable a world powered by reliable and affordable solar electricity. We offer the most bankable solar energy solutions in the world. With the strongest financial stability in the industry, the use of our technology in debt-financed projects is unparalleled. Our bankable energy solutions provide access to capital and low-cost financing to leading utilities and energy investors. It’s a simple choice – one can make payments (or pay cash) on a $15,000 system that will last at least 25 years or pay $30,000 or more to a utility for the same amount of power. In many U.S. states this is the case – conventional power costs twice as much as solar over the long term. We could tell you that we’re the biggest and best home solar company. We could tell you we install a new system every 6 minutes, or that we focus exclusively on residential solar. We could even tell you about our A+ ratings with the BBB and Angie’s List. Then there’s the 20%1 you can save. Solar panels account for about a third of the overall cost of a home solar power system.When you go solar with Sunrun, you don’t have to pay the high cost of solar panels because you choose whether you want to buy the panels or pay as you go through a lease or ppa. Solar system costs can vary widely, depending on which incentives are available and how you choose to finance your solar system. In addition, the type of solar panels you choose and the overall size of your system can determine your solar system cost. If you choose to go solar with Sunrun, we purchase the entire solar system for you, or you can purchase the system yourself if you’d rather do that. Our experts will select panels that are right for your home and system size that best fits your family’s needs. Instead of paying for a solar system, you pay a fixed monthly amount to install solar panels and use the electricity they generate. It’s easy and affordable. It’s also popular. According to a recent report*, over 70% of homeowners in states with mature solar markets choose a solar lease or PPA. Sunrun solar leasing makes residential solar energy more affordable. If you don’t want to pay a large upfront cost, you can still go solar today by taking advantage of Sunrun’s solar service. Sunrun purchases your home solar system and has it installed on your roof. You pay little to nothing upfront, and then a low, fixed amount every month. You’re entitled to all the energy produced by your home’s system, often including excess energy credits from your utility company. You can transfer the agreement if you sell your home. We are working hard at expanding our residential solar energy services; currently If we don’t offer solar in your state, stay tuned – we could see you soon! As of 2016, it’s approximately $3.00 per watt, installed. The average sized solar panel system is 5,000 watts, so this brings the total cost to $15,000. That 15k figure is just an average amount. Systems can cost more or less mostly depending upon a homeowner’s energy usage. Generally, Solar PV systems that generate electricity from sunlight cost between $1.95 to $6 per installed watt. Typically, the larger the system, the lower price per watt. Large commercial systems are typically well below $3 per watt. An average home in the United States requires approximately 20 to 24 kWh of electricity every day. An array able to produce this much power must 4 kW or larger (based on 5 sun hours per day). The average cost of a solar system of this size is $17,000 and ranges from $15,000 to $20,000 installed (not taking any incentives into consideration). How much can you afford to invest in offsetting your energy bill? The fact remains that many homeowners are still getting their solar panels from long term leasing companies. The costs for solar installation with these companies, as with all of the other costs, are hidden in the lease payment. The bottom line is that solar power gets pretty expensive after lease payments are added up for a 20 year term. Whether this high cost gets attributed to the panels or installation service, the numbers remain the same. Instead of taking on a 20 or 30 year commitment, many homeowners are finding that they can get their own financing and have their solar panel systems paid off within 7 or 8 years at most. This, of course, is only possible when people seek out solar contractors that charge a very reasonable installation fee. 1. Cost of equipment – panels, inverter, wiring, etc. 2. Cost of installation service. 3. Cost of permitting, inspection, and interconnection. The price that a typical homeowner has paid to get a non-leased, fair-priced solar panel system installed is approximately $1.00 per watt. This figure is only for a contractor’s solar installation service. For a typical 5,000 watt system this would be $5,000. Money from this figure goes towards an installer’s supply chain costs, labor, overhead, and profit margin. A high percentage of the total cost of going solar is attributed to the cost of equipment and installation service. the total cost of an installed solar panel system is $3.50 per watt, on average. So installation services are about one third of the total cost for someone who wants to go solar. The average size for a home solar install is 6.7 KW which would range from $28,000 to $34,000. For typical Californians this will mean a lifetime savings around $100,000. Most of our customers don’t actually pay for the solar panels. They choose a free system. Traditional Installs are a great way to go solar if you don’t mind a large up front cost. Typically systems like this will pay for themselves in 5-10 years depending on electricity usage. Because of the longer term ROI most people choose to go with a Power Purchase Agreement where you can skip the install cost and just pay for the power. No matter how you choose to go solar typically all parts are warrantied for 20 years including panels, inverters, mounts, etc. We built software to help us design accurate and guaranteed quotes. Give us a call or fill out the form below and we’ll have a solar expert perform a free shade analysis and system design. With a PPA we do all the work of designing, installing, and maintaining your system and you agree to purchase the power you use from the panels. Most customers reduce their monthly power bill by at least $50 (no hidden fees). Find out if your home is a good fit with a free solar consultation from one of our solar experts. The effective rate for solar power spread across the life of a system is $0.08/kWh. The average cost for conventional energy is $0.12/kWh and rising. The fact remains that the cost of the panels is just one of many costs associated with getting a solar panel system installed on a home. Permitting, inspection, interconnection, and installation costs must also be accounted for. While many manufacturer’s panels are a bit more, it is possible to find panels as low as $0.70 per watt as of early 2016. This can be misleading because a system’s total price is not as simple as adding up the number of watts needed by the price per watt. For example, a typical 5,000 watt system multiplied by $0.70 per watt would equal a price of $3,500. This is considerably less than what a solar power system actually costs. The price for the system in this example is closer to $15,000 than $3,500. SunPower once again holds the record for the world’s most efficient rooftop solar module, achieving an NREL-validated 24.1 percent. A $750 million solar facility in Buffalo will produce a gigawatt of high-efficiency solar panels per year and make the technology far more attractive to homeowners. The record panel was manufactured on the company’s 100-megawatt pilot production line — its Buffalo factory won’t be at full production until 2017, with a target of 10,000 solar panels per day at full capacity. SolarCity’s sprawling Buffalo factory, built and paid for by the state of New York, is nearing completion and will soon begin producing some of the most efficient solar panels available commercially. Capable of making 10,000 solar panels a day, or one gigawatt of solar capacity a year, it will be the largest solar manufacturing plant in North America and one of the biggest in the world. When production begins, SolarCity, already the leading installer of residential solar panels in the United States, will become a vertically integrated manufacturer and provider—doing everything from making the solar cells to putting them on rooftops. Solar panels installed by SolarCity cost the company $2.84 per watt (including sales and marketing plus overhead, in addition to the cost of the hardware), down from $4.73 in 2012. The combination of the new, highly efficient panels, the volume of product coming out of the new factory, and a simplified manufacturing process is a big reason why the company expects its costs for residential solar to fall well below $2.50 per watt by the end of 2017, when the Buffalo facility reaches full production. Bolstered by federal solar subsidies and “net metering,” the rules that allow homeowners to sell excess power back to the grid at retail prices in many states, SolarCity is already leading the way in making residential systems financially attractive to many households, spurring an explosion in the popularity of the rooftop panels. Key to the company’s ambitions is a technology it acquired when it bought a small solar company called Silevo in 2014. SolarCity has pushed back the target date for full production from the Buffalo factory from the first quarter of 2017 to later in the year. Meanwhile, efficiencies in the lab are even higher: researchers have made exotic solar-cell materials with efficiencies of up to 40 percent. Future advances, he says, will entail much lighter, flexible panels that offer much higher efficiencies and are even cheaper to install—and thus produce electricity at a much lower cost. The high-efficiency panels that SolarCity plans to make in Buffalo will be an important part of efforts to reduce costs and speed the adoption of solar energy, Musk said in a conference call Wednesday. And extending the use of solar energy is part of Musk’s broader vision of putting Tesla at the center of what he sees as the sustainable energy industry of the future: Combining solar power with batteries that allow it to be stored and used at any time of the day or night, and building affordable electric cars that eventually replace today’s gas-powered vehicles. Trump overstates his vice-presidential pick’s role in his state’s economy, which has tracked nearly in parallel with national numbers on unemployment. Indiana’s unemployment has indeed dropped 3.4% since January 2013, according to the Bureau of Labor Statistcs; but per the Federal Reserve, US unemployment has dropped 3.3% since then, 8% to 4.7%. Trump also has his figures slightly off: preliminary data for May 2016 shows the Indiana unemployment rate at 5% – actually an increase from a recent low of 4.5% in November 2015. The average homeowner would save at least $25,000 over 25 years by investing in a solar panel system. So what is the current low-end cost of residential solar power? As of 2016, it’s approximately $3.00 per watt, installed. The average sized solar panel system is 5,000 watts, so this brings the total cost to $15,000. That 15k figure is just an average amount. Systems can cost more or less mostly depending upon a homeowner’s energy usage. As low as $3.00 per watt. Average total cost – $15,000. 8 cents per kilowatt hour. $159/mo for a $15,000 ten year loan at 5% interest. As low as $2.00 per watt. Average total cost – $10,500. 6 cents per kilowatt hour. $111/mo for a $10,500 ten year loan at 5% interest. a quote for the maxium power to fit in a 15,000 SF rooftop space. Include all equipment as necessary such ad meters, dc controllers, panels, racking, inverter etc and installation. Site is a business office in Northern VA.
Also I will include a consultant fee for you on 10% of our CP sales price to cover your efforts fir the project. I need itemized pricing as well. At the time of this writing, the installed cost of solar panels was between $7-$9 per watt: A 5 kW system would cost around $25,000-$35,000. Many utility companies offer incentives, and some subsidize as much as 50% of system costs. He cited “three big trends” in solar power. First Solar just set another world record for cadmium telluride (CdTe) solar module efficiency, hitting 18.6 percent aperture efficiency for a full-size module. Dozens of solar startups have promised silicon performance at thin-film prices. First Solar is actually doing that today. Modules built at the company’s Malaysian facility currently have a cost of less than 40 cents per watt, according to the firm. Yingli specs 15.6 percent for its multicrystalline solar panels modules and delivers 17.2 percent with its n-doped mono silicon. Trina specs a 15.9 percent (max) multicrystalline panel. SolarWorld specs a 17-percent-efficient mono panel. The cumulative global market for solar PV is expected to triple by 2020 to almost 700 gigawatts, with annual demand eclipsing 100 gigawatts in 2019. Solar demand will likely be almost entirely market-based in 2020; a dramatic shift from 2012 when almost all demand was premised on direct incentives. One implication of an increasingly unsubsidized market is that management and governance of the electric grid will change dramatically, creating both new opportunities and challenges for solar companies. This transformation is already underway with the implementation of market-based mechanisms for PV procurement and solar companies exploring innovations in business model design. Joint year-in-review report conducted by SEIA and GTM Research finds residential system prices fell to $3.50 per watt last year, but largest price declines recorded in utility fixed-tilt sector, where costs hit a low of $1.33/W. By the fourth quarter of last year, the average cost per watt for residential solar was $3.50. Of that figure, GTM Research and SEIA calculate that 65% is comprised of onsite labor, engineering, permitting and other soft costs. The analysis shows that soft costs in the residential solar sector have actually risen 7% over the course of the past 12 months (largely due to the labor- and time-intensive sales practices of the leading solar leasing providers, many of which go door-to-door to sign up new customers), while at the same time residential hardware costs have dropped 16%. The commercial rooftop sector has enjoyed similar price falls for hardware (15%), and a modest 6% decrease in soft costs. by Q4, a typical commercial installation cost $2 per watt, of which 50% was comprised of soft costs. “In order to continue reducing costs, developers and EPCs are looking to squeeze additional power density for commercial sites and amortize fixed costs over more power output – and therefore reduce dollar-per-watt and dollar-per-kilowatt-hour costs,” said the report. In the ground-mount, utility-scale solar sectors, prices for PV at the end of Q4 2015 stood at $1.33 per watt and $1.54 per watt in the fixed-tilt and tracking segments respectively. Price variations nationally are more tightly clustered in the utility markets, but there are some regional variations – the cheapest large-scale solar in terms of system costs is found in the Southeast U.S., for example. Growth into new markets is having the effect of broadening EPCs’ and developers’ economies of scale, forcing greater optimization in logistics and supply chains and, thus, delivering even lower costs. 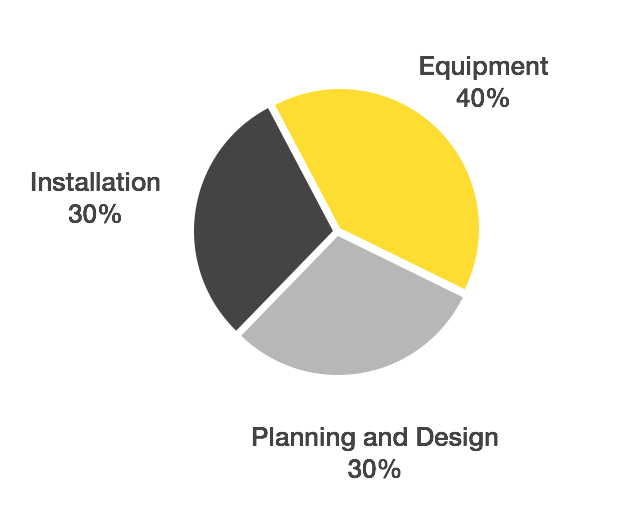 Equally, as installers become more adept at reaching and serving new markets, more mature installation practices are becoming the norm, which in turn is bringing down soft costs – they fell a massive 37% in the fixed-tilt segment last year, and 23% for tracking projects.